JBL Control SB-2 Surface Mount Subwoofer DJParts - All Variety of Parts that DJ Needs. 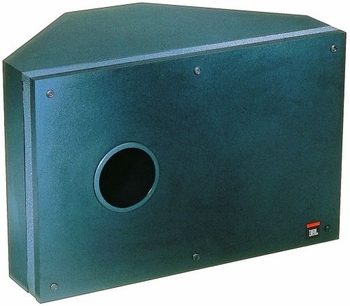 The Control SB-2 provides low frequency reinforcement in subwoofer/satellite systems. The Control SB-2 is ideal for foreground music and music/paging systems in restaurants, retail establishments, theme bars, music cafes, health clubs, and other indoor applications. The unique slot-load vented design provides acoustic low-pass filtering. Compared to traditional bandpass subwoofers, the SB-2 offers superior musical clarity and bass impact. The satellite outputs are highpass filtered, reducing overall system distortion by eliminating the need for the satellite speakers to reproduce frequencies in the low bass range. The satellites operate more efficiently, maintaining excellent midrange clarity and realism in music and paging. The high-pass filtering also allows a greater number of satellite speakers to be paralleled in the system by increasing the impedance the amplifier sees in the subwoofer range. The stereo inputs are 8 ohms each. The combination of the satellite high-pass filtering, the acoustic slotload filtering and a built-in 2nd order low-pass crossover network results in smoother overall system frequency response and virtually eliminates the “muddiness” typical of other subwoofer/satellite systems by reducing frequency overlap in the low midrange.  Control® SB-2 Stereo Input Dual Coil Subwoofer The Control SB-2 incorporates a long-excursion 250mm (10in) transducer providing usable output to 38 Hz. Dual voice coils on the transducer allow the single cabinet to reproduce subwoofer frequencies for both the left and right channels while maintaining channel separation in the satellites. Subwoofer placement can be used as a tool for adjusting output sensitivity to match that of the satellite speakers and the requirements of the application. Positioning the SB-2 at the junction of three boundaries (i.e. - at a floor/wall/wall or ceiling/wall/wall junction) yields maximum output sensitivity for use with high sensitivity satellites or for subwoofer-heavy applications. Placement at the junction of two boundaries (i.e. - floor/wall,ceiling/wall or wall/wall) reduces the subwoofer level by 3 dB. Placement in the middle of a single boundary (i.e. - wall, floor or ceiling) further reduces subwoofer output sensitivity by another 3 dB, to match with less efficient or higher impedance satellite systems. Nominal Impedance: 8 ohms per input; 4 ohms total with both inputs paralleled. Optimum System Configuration: Four JBL Control 23 satellite speakers (two on each SB-2 satellite output) provide optimum sensitivity balance and impedance loading, resulting in full-range 38 Hz - 22 kHz system performance. Broadband impedance is 4Ù per input x 2 channels.